Mix one scoop of SELECT Café Protein with ~8 oz cold water, milk, or milk substitute. Amount of liquid can be adjusted to meet your taste preference. Consume enough protein to meet your daily protein requirement through a combination of high protein foods and protein supplements. For more ways to enjoy see left side panel of product label. CONTAINS CAFFEINE. This product is only intended to be consumed by healthy individuals over the age of 18. Pregnant or nursing women should not use this product without first consulting their physician. Discontinue use and immediately consult your healthcare professional if you experience any adverse reaction to this product. Do not use if safety seal is broken or missing. Ultra Premium Protein Blend (Milk Protein Isolate, [comprised of casein protein, and whey protein], Whey Protein Concentrate 80%, Leucine Peptides), Natural And Artificial Flavors, Sodium Chloride, Potassium Chloride, Cocoa Powder, Guar Gum, Sucralose, Acesulfame Potassium. Mix one scoop of SELECT PROTEIN™ with 6-8 oz. of cold water. Amount of water can be adjusted to meet your individual taste preference. To increase your protein intake per serving or to achieve a richer taste, use non-fat or low fat milk. Take 1-3 servings daily. This product is only intended to be consumed by healthy individuals. Pregnant or nursing women should not use this product. Discontinue use 2 weeks prior to surgery. Discontinue use and immediately consult your health care professional if you experience any adverse reaction to this product. Do not exceed recommended serving. Do not use if safety seal is broken or missing. KEEP OUT OF REACH OF CHILDREN. Ultra Premium Protein Blend (Milk Protein Isolate, [comprised of casein protein, and whey protein], Whey Protein Concentrate 80%, Leucine Peptides), Sodium Chloride, Natural And Artificial Flavors, Guar Gum, Sucralose, Acesulfame Potassium, Ground Vanilla Beans. Mix one scoop of SELECT PROTEIN™ with 6-8 oz. of cold water. Amount of water can be adjusted to meet your individual taste preference. To increase your protein intake per serving or to achieve a richer taste, use non-fat or low fat milk. Select Protein Blend (Milk Protein Isolate, [comprised of casein protein, and whey protein], Whey Protein Concentrate 80%, Leucine Peptides), Peanut Flour, Natural And Artificial Flavors, Salt, Guar Gum, Sucralose, Acesulfame Potassium. 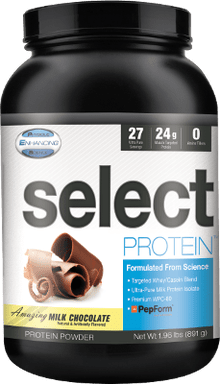 Select Protein Blend (Milk Protein Isolate, [comprised of casein protein, and whey protein], Whey Protein Concentrate 80%, Leucine Peptides), Natural and Artificial Flavors, Salt, Guar Gum, Sucralose, Acesulfame Potassium. Ultra Premium Protein Blend (Milk Protein Isolate, [comprised of casein protein, and whey protein], Whey Protein Concentrate 80%, Leucine Peptides), Natural And Artificial Flavors, Salt, Guar Gum, Sucralose, Acesulfame Potassium. Select Protein Blend (Milk Protein Isolate, [comprised of casein protein, and whey protein], Whey Protein Concentrate 80%, Leucine Peptides), Natural and Artificial Flavors, Salt, Potassium Chloride, Cocoa Powder (Alkali Processed), Guar Gum, Sucralose, Acesulfame Potassium. 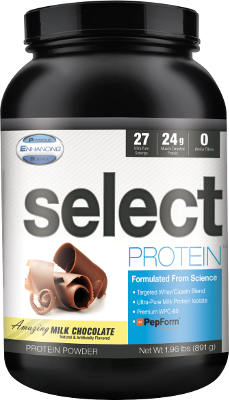 Select Protein Blend (Milk Protein Isolate, [comprised of casein protein, and whey protein], Whey Protein Concentrate 80%, Leucine Peptides), Natural and Artificial Flavors, Sodium Chloride, Ground Vanilla Beans, Guar Gum, Sucralose, Acesulfame Potassium. Select Protein Blend (Milk Protein Isolate, [comprised of casein protein, and whey protein], Whey Protein Concentrate 80%, Leucine Peptides), Natural and Artificial Flavors, Cocoa Powder (Alkali Processed), Sodium Chloride, Guar Gum, Sucralose, Acesulfame Potassium. Select Protein Blend (Milk Protein Isolate, [comprised of casein protein, and whey protein], Whey Protein Concentrate 80%, Leucine Peptides), Sodium Chloride, Natural and Artificial Flavors, Guar Gum, Sucralose, Acesulfame Potassium, Ground Vanilla Beans. Contains peanut, milk and soy ingredients. Select Protein Blend (Milk Protein Isolate, [comprised of casein protein, and whey protein], Whey Protein Concentrate 80%, Leucine Peptides), Peanut Flour, Natural and Artificial Flavors, Sodium Chloride, Guar Gum, Sucralose, Acesulfame Potassium. PES Select Protein has been third-party tested by the Stack3d Certified Program, and the lab results are in: MORE protein than listed on the label! This is hands down the best new protein powder to enter the market over the past couple of years! This protein is a blend of whey & casein protein. They do this so that it gives you both a quick digesting protein (whey) and a slower digestion protein (casein). This way your body gives you a constant supply of amino acids to help build muscle. The reason PES calls this "Muscle Targeted Protein". What is Leucine? It's been the talk of the industry for years now. Leucine is a key determinant in how much protein synthesis your muscle can achieve after a workout. This protein is loaded with Leucine. Why Leucine? It's been shown to improve lean muscle gain, exercise performance, and muscle protein synthesis. It's been shown to improve lean muscle gain, exercise performance, and muscle protein synthesis. Delivers a trifecta of muscle-targeted ingredients geared to stimulate and sustain muscle protein synthesis. This means more muscle gain, better performance in the gym and a higher state of muscle protein synethesis. 24g of protein, 1g of carbs and 1.5g of fat per serving. Take one scoop and mix it into water For a thicker and creamy shake, mix one scoop with fat free milk or almond milk.